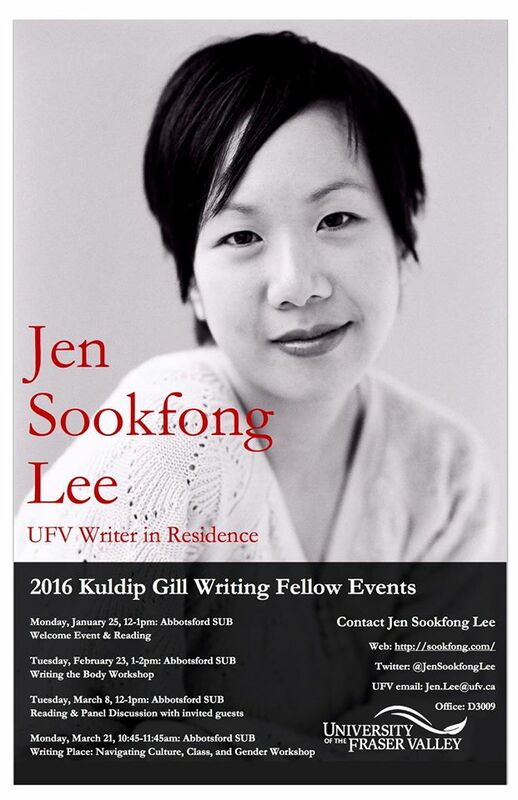 A huge welcome to our 2016 Writer-in-Residence extraordinaire, Jen Sookfong Lee! Here’s what her impressive experience as a writer has taught her about finding her voice . . .
During my very first lecture at UFV, I was asked a couple of questions that no one had ever asked me before: how did you find your voice? Did it spring from you fully formed, or did you have to work to find it? Some background on me: I grew up in East Vancouver, in a working class neighbourhood filled with families from everywhere. Our closest neighbours were Italian, the Fijian family lived down the street, and the big house on the corner was occupied by a large, bustling foster family. As diverse as these families were, I grew up not knowing anyone who worked in the arts. Sure, we had our local piano teacher and my friend Klea’s ex-hippie parents who painted murals on their living room walls whenever they felt like they needed a change, but everyone had tangible jobs. They were butchers, drywallers, seamstresses, and bus drivers. We weeded the vegetable garden on the weekends and cut out coupons from the flyers that were delivered every week. Becoming a writer or a musician or an actor was a dream, something that rich kids did because someone else was paying the bills. Work and effort and a job that paid were the end goals for everyone. It was how we could one day save enough to move out of East Vancouver. It was what would keep us from addiction and poverty and homelessness. It exhausted us, but we firmly believed it also made us better. For people who grow up with little, work is respect. This idea of work applies to everything I do, and writing is no exception. You don’t finish a novel without work. You don’t promote a book without work. When that student two weeks ago asked about my voice, I realized, right away, that even this, the most intangible part of being a writer, couldn’t have happened without work. I wrote in circles for years, padding my poems and stories with what I thought I was supposed to write. Long descriptions of rain. Sad lines about ex-boyfriends. And even odder things, like images based on Napoleon’s long and tortured exile at the end of his life. I had no idea at the time that I was trying everything to see what would stick. Not all of it was successful. Who am I kidding? Most of it wasn’t. When I found my voice, I knew immediately. I wrote a poem and it felt right. It wasn’t a perfect poem by any means, but finally I knew I was writing from my very core, and that I was writing something that no one else had or ever will. This—the voice and the poem it produced—were all mine. And it had taken years of work and mountains of discarded manuscripts to get there. Of course, voice isn’t immutable. It changes as we grow older, and with every project. But I think our essential perspective and the ways in which we construct sentences and images have a kind of stylistic and thematic consistency, from novel to poem to memoir. Let’s be honest. I will always write about the rain. And, like it or not, the ex-boyfriends still appear in my work, although perhaps they’re better hidden now than they used to be.